THE Shalom House drug rehab charity is running the risk of copping a $50,000 fine and more by running what appears to be an illegal car repair business from a rural property in Bullsbrook. The controversial charity, which already operates two other service businesses in the Swan Valley, is promoting its latest venture under the name of Shalom Mechanics. Promotional posts on Shalom House’s Facebook page say the business offers major and minor car services as well as electrical and fabrication repairs. “With professional, qualified and insured mechanics, your vehicles and machinery are in safe hands,” the promo says. Under the Motor Vehicle Repairers Act 2003, anyone carrying on the business of a motor vehicle repairer is required to have a licence from the Commissioner for Consumer Protection. Consumer Protection’s online register indicates that West Australian Shalom Group (WASG), the charity that runs Shalom House, does not have that licence. Fines for breaches of the Motor Vehicle Repairers Act can be as high as $50,000 plus a daily penalty of $1000. A search of the Australian Securities and Investments Commission online register indicates that the trading name of Shalom Mechanics has not been registered. It is an offence under the Business Names Registration Act 2011 to run an unregistered business. The general manager of automotive at Consumer Protection WA, Angelo Barbaro, said under the Motor Vehicle Repairers Act 2003, anyone carrying on the business of a motor vehicle repairer is required to have a licence. “A sole trader, a partnership or a body corporate can apply for this licence,” he said. “The premises, fixed or mobile, where the work is to be carried out will also need to be authorised. “The business must also have at least one certified repairer for each class of repair work it carries out. The City of Swan has confirmed that WASG does not have planning approval to operate a business on the Great Northern Highway land, which is zoned general rural/special use. The charity, founded by self-confessed former drug addict and dealer Peter Lyndon-James, has a long history of running its drug rehab program without the necessary planning approval. Peter Lyndon-James. Picture: David Baylis. Shalom House has been embroiled in a long-running legal battle with the City of Swan over its operations since 2015. The case is now in the State Administrative Tribunal. 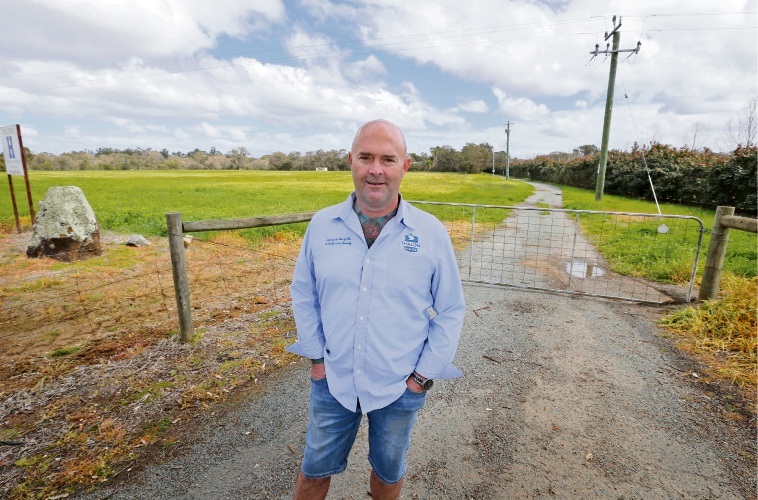 The charity bought the land at 1973 Great Northern Highway, Bullsbrook, last year for $1.35 million and plans to build a $7.5 million administration hub and 600-seat auditorium on the 16-hectare site. 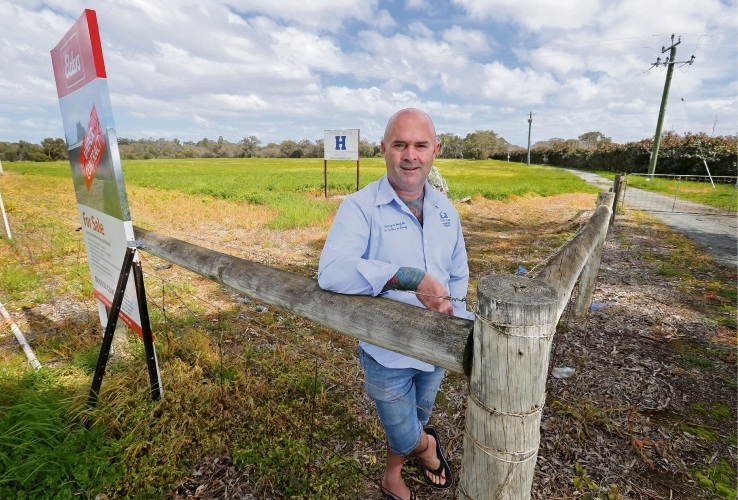 The development proposal has met with some local opposition and the City of Swan made two site inspections last year to investigate alleged unauthorised activity on the property. Mr Lyndon-James was a City of Swan councillor at the time. The site inspections followed complaints from neighbours that men were living in a large shed and that some construction work and land clearing were taking place. City of Swan development compliance officers reported that the property was also being used for the repair of some vehicles and machinery that belonged to the charity. The officers, who visited the site in November, concluded it was not a “commercial enterprise”. 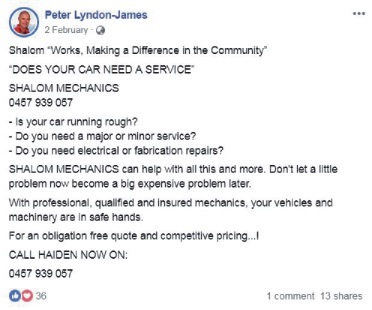 However, in January, Shalom Mechanics began spruiking for business on the charity’s Facebook page, offering car owners an “obligation free quote and competitive pricing” . Mr Lyndon-James refused to answer questions from Community News on why he had not sought approval to operate the mechanical repair business at the property. In December he resigned from the City of Swan, saying he was frustrated by council regulations, red tape and bureaucracy.